Just as a follow-up to my snack food post, Guilt Free, I wanted to let those of you who may be wondering, the expensive snack I tried was good, but not great. But since I realized I had built it up so much in my mind over several weeks that it never could have met my expectations, I did ask my husband what he thought about it. He agreed it was good, but not great. As further confirmation, there is still a partial bag in my pantry which means no one in my family was thrilled. My point in that post was simply that living the resurrected life, on this side of the cross, means that we are no longer constrained by guilt. We are in fact guilt free and that is where I would like to pick up and continue. The reason that we are guilt free is that God so loved the world. As believers in Jesus Christ, He set us free from the law of sin and death. We have been crucified with Christ and have died to the law. The law is what used to convict us and pronounce us guilty. As believers in Jesus Christ we no longer live by the law, we live by the Spirit. In Christ, the law no longer has the power to convict us. We are well-loved people. God is love and out of His divine nature He beckons us to live in that love with Him, through the blood of Jesus – or to put it another way, to put on our tiaras and reign in life and live abundantly. Often though, we choose much less than God’s perfect love. When I allow guilt or fear (residuals of the law) to keep me from embracing all that God has for me, then I am living a “less than” life. So as I was thinking about what it meant to live well-loved (e.g. embrace all that God has for me, to receive His love, to live in expectancy) and what that would look like in day-to-day life, I got this mental picture of Will Ferrell’s character Buddy the Elf. Yes, from the movie Elf. I really am not trying to lose all credibility here (if I ever had any), so hang in there with me for just a little longer. By the way, Elf is one of my favorite movies and once again I have to ask you not to judge me and not to email me, I am simply sharing my heart here :). I LOVE how Buddy moves through almost every scene in that movie expecting good things to happen. He never self-protects, he never shields his heart, or erects walls between himself and others. In fact, he isn’t even aware of the walls others have built to protect themselves. He just pushes right through them. He opens himself to everyone he meets, he celebrates even the smallest things (that “World’s Best Cup of Coffee” scene makes me laugh until I almost wet myself), he enjoys every second of his life (the “The Revolving Door Scene”). He fully embraces other people for who they are, not what he wants them to be. Even when his birth father rejects him at the beginning of the movie he never loses hope. He lives well-loved (by Santa and Papa Elf) and out of that loves other people. I realize the analogy could start breaking down at any second here so I’m going to restrain myself from going further with it. But the truth is, I smile every time I think about it. I could go on and on about Buddy the Elf, but by the time I elaborated on all the examples of living expectantly and well-loved, then I would really have recounted the entire film. So, if you haven’t seen it, watch it. If you have…well I think you get my point. I am not advocating wearing a Happy Mask every single day. Real is better than well-behaved. God can deal with real, fake…well that’s just hiding and being dishonest. Honesty, even if it is ugly, is one of the characteristics of the abundant life. 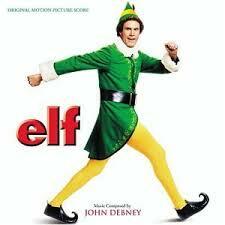 When I talk about Buddy the Elf, I am talking about living from who we are, not developing a formula for how to live. We don’t need to all go buy elf costumes and pour maple syrup on everything we eat. That would just be exchanging one law for another and every time we reduce living the Christian life to a formula we are cheapening the gospel. It is so much more than a formula and a set of rules. And yet it is simple, living in dependent relationship with God. I am going to pause here and leave you with one more thought that I want to talk about next time: Love transforms us from the inside out, while the law conforms us from the outside in. This entry was posted in Grace, Relationships and tagged Abundant life, Christ, Elf, God, Jesus, Jesus Christ, Law, Will Ferrell.